A Nose Job, also called a Rhinoplasty, is one of the most popular plastic surgery procedures due to the nose being central to the facial features, therefore any deformity or imbalance can have a major impact on the psychological well-being of the person. A person with a nose deformity, bump or crooked nose, can suffer low self-esteem and become withdrawn, avoiding social contacts or situations such as photographs. Deformities or imbalance of the nose may arise from family trait, injury or cancer. Post-injury deformities of the nose can affect the breathing and also may carry anti-social stigmata. Deformities of the septum – internal nose, which affect breathing can contribute to sinus problems and overall health. Does Rhinoplasty Surgery require a general anaesthetic or hospitalisation? Rhinoplasty surgery is performed under general anaesthetic, commonly as a day-case or overnight procedure. Rhinoplasty Surgery normally takes approximately 1 hour to 1 ½ hours to perform depending on the complexity of the surgery. Mild pain / discomfort is expected for 3 – 5 days. Patients can go back to their normal daily activities after 1 week, but avoid strenuous exercise / activity for 6 weeks including any contact sports to allow full healing of the nose. Will packs be used in the nostrils after Rhinoplasty Surgery? In the majority of Rhinoplasty Surgery, nasal packs (like small tampons) will be inserted into the nostrils at the end of the operation. Packs are utilised to absorb any bleeding after the operation and importantly splint or support the internal part of the nose in the early post-operative period. In complex Nose Surgery, e.g. Septo-Rhinoplasty, the nasal packs may be required for 7 days post operatively. The packs are normally removed before you leave Hospital or at your 1 week post op visit. A Rhinoplasty, nose job surgery is carried out to reshape the nose to achieve a more aesthetically balanced nose or correct a deformity of the nose which may be congential (born with) or following an injury. Rhinoplasty surgery is commonly a reduction of a large nose (hump or wide)– Reduction Rhinoplasty. However, some patients have a nose which is too small for their features and an Augmentation Rhinoplasty is therefore required. A Corrective Rhinoplasty is correctly used for reshaping the nose following an injury while a Revision Rhinoplasty aims to correct a residual deformity(s) following a prior Rhinoplasty. What are the benefits of Rhinoplasty Surgery? The nose is central to the face and therefore a nose which is out of balance to the face (forehead and chin) stands out and becomes the dominant feature (look at family photos!). Nose Job, Rhinoplasty surgery aims to correct this imbalance in the nose and therefore make the nose less obvious i.e. aesthetically balanced with the facial proportions. It is important to realise that each nose is unique and must be in balance with the rest of the face – or it will stand out. A good Rhinoplasty should be almost undetectable as the nose is in balance with the face. This result can restore self-confidence and boost self-esteem. Common to all surgical procedures there are always risks associated with Nose Job surgery. However, complications are uncommon. The most frequent is irregularity following surgery in about 5%. This may require revision surgery or nonsurgical treatment. Bruising is common and may take 2 weeks to resolve, while major bleeding is rare. Infection is infrequent (less than 0.5%) and will require a course of appropriate antibiotics. Hypertrophic or keloid scarring is also rare but will require specific treatments to reduce the scarring. Altered sense of smell is common after Nose Job and resolves after 6 – 8 weeks. If you would like to improve your nose, remove a bump or straighten, to achieve an aesthetically balanced nose which is in proportion to your face, then Rhinoplasty surgery is right for you. Nose Job can correct deformities resulting from an injury or with which you were born or developed in adulthood. You should be realistic as to what can be achieved by Rhinoplasty Surgery and understand the risks and side effects of this surgery. What reassurance do I have with Rhinoplasty Surgery? 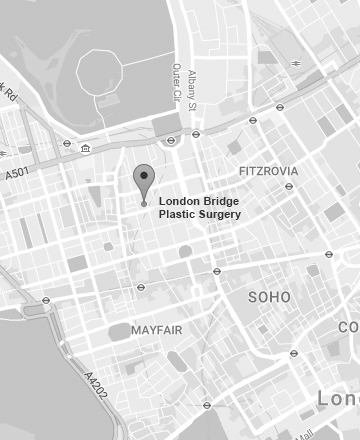 At LBPS, we understand that your decision to have Rhinoplasty surgery can be a daunting and anxious time for you. Our aim is to fully understand your concerns and desires, and assess your nose accurately, before agreeing on a treatment plan which is in your best interest. With our expertise in over 500 Rhinoplasties we can assure you of a very high standard of care. If for any reason you are unsuitable for Rhinoplasty Surgery, you will be advised against this form of surgery. We will provide you with all the information you need and support before, during and after your surgery. The cost for Nose Job, Rhinoplasty Surgery starts from £1500 for reshaping of the nostrils or can start from £7000 for more complex cases, and includes your pre-operative and post-operative care. You will be provided with a detailed quotation following your Consultation. What about the scars following Rhinoplasty Surgery? Most cases of first Rhinoplasty surgery do not require any external or visible scar. However, in some cases, commonly following injuries, but also developmental abnormalities of the nose, an external scar in the columella is necessary to perform an Open Rhinoplasty. Open Rhinoplasty should be reserved for complex tip surgery and revision surgery to the tip of the nose, it should not be used in every Rhinoplasty. Occasionally, some noses are too wide and this requires a resection of tissue around the nostrils, resulting in a scar in the groove between the nostril and the cheek; i.e. the alar base resection. Can Rhinoplasty Surgery be performed at the same time as other procedures? Yes, Rhinoplasty, Nose Reshaping is commonly performed together with other face surgery such as Face Lift, Brow Lift, Chin Augmentation or Reduction as well as Breast Surgery, Augmentation or Liposuction. What is appropriate and safe for you to combine will depend on your Medical Health, your goals and the individual procedures. The results are first and foremost natural. The goals of Rhinoplasty Surgery are to restore an aesthetically pleasing nose which is in balance with your facial features – i.e. looks natural and does not appear abnormal. Each nose is individual and therefore what is suitable for you will not necessarily be good on another face and vice versa. Remember that it can take up to 12 or 18 months before the final appearance of the nose is achieved. The results of Rhinoplasty are permanent but note that as you age your nose will change over the years. For example, the tissues around the tip of the nose may become thinner and allow the tip to droop. Is there an alternative to a Rhinoplasty Surgery? Yes, if Rhinoplasty Surgery is not appropriate or not desired, Non-surgical Nose Shaping of the using an injectable product such as Belotero or Radiesse can provide good improvement in the shape and symmetry of the nose in a simple local anaesthetic treatment. Important to clearly state the areas of concern, your aims / desires for shaping your nose. If you have difficulty breathing from either nostril, this should be corrected at time of your Rhinoplasty surgery. This may be troublesome after operation. Take antihistamines starting 1 day before your surgery and continue for 5 or 6 days after. Essential to stop at least 3 weeks before surgery and until wounds are fully healed or at least 3 weeks after. Avoid aspirin/ibuprofen type analgesics for 2 weeks pre-op. Note that thick skin/sebaceous especially at tip will limit refinement and may take up to 12 months to completely settle. General anaesthetic, occasionally local with sedation. Inside nostrils, occasionally small scar under tip of nose (columella) or at side of nostril. Dissolving usually take 2 weeks. Micropore tape alone or with a nasal splint (POP). Nasal packs for 24 hours or for 6 or 7 days. Usually overnight or day case. Remain intact for 6-7 days. Use 2 – 3 pillows for 2 weeks post –op. Avoid bending over. Avoid vigorous exercise for 6 weeks. No contact sports for 6 weeks. Avoid aspirin / ibuprofen type analgesics for 2 weeks post-op. Blowing nose Must NOT blow nose for 2 weeks post-op. Sniffing is permitted.